Rane RS6 Power Supply DJParts - All Variety of Parts that DJ Needs. 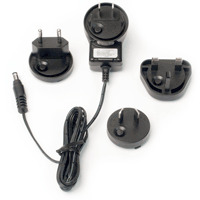 RS 6 universal power supply only works with the Rane SL 2, SL 3 or SL 4.The supply includes different input plugs for the USA, Europe, UK and Australia. The USA plug is attached at the factory — you may need to replace it in your country. To remove a plug, push the button while turning the outer rim counterclockwise. To attach a plug, rotate it to fit into the supply and turn clockwise until it locks in place. This power supply is regulated 7.5 volts DC, 1 amp, using a P6 type barrel plug.